Allan R. Bevere: Should We Lie to Children About Santa? 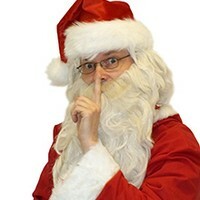 Should We Lie to Children About Santa? Of course, not everyone’s a fan – some oppose the Santa myth on religious grounds. Others dread the day when their child inevitably learns – usually from other children – that Santa (spoiler alert!) isn’t real. Others, however, reflect joyfully on their childhood Christmas experiences, and hope to recapture some of that magic with their own youngsters. But what effect does this all have on children and their development – are we better off just telling them the truth from the outset? Let’s take a look at the ---scientific evidence. The pros and cons can be read here.